A medium-duty, economical litter designed for durability and versatility, featuring unique tubular runner rails that span the full length of the litter along the bottom. These provide a very strong, durable base, making it far more difficult to damage during regular use compared to other baskets that simply use a flat bar. A very cost-effective alternative to the more heavy-duty stainless steel models, this powder-coated steel litter with Durathene™ netting meets the needs of many users who only use litters occasionally, or who are on very limited budgets for rescue equipment. 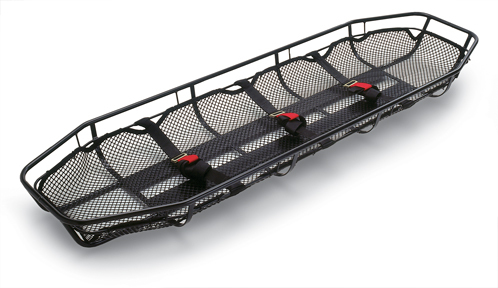 Our Disaster Response Litter comes in black with four litter straps. The narrower, confined space model fits through tight openings.